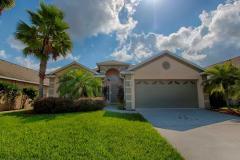 This gorgeous and well maintained vacation home with an open floor plan is ready for you. There is lots of room for everyone! The living room is huge and not to mention the very large kitchen with an island. The elegant and grand staircase welcomes you into this 4 bedroom & 3 bathroom Villa. We have a master bedroom with a beautiful en-suite bathroom and a King size bed, 2nd bedroom also a King size bed, 3rd bedroom two twin size beds & 4th bedroom has a full size bed. Fully equipped kitchen, downstairs bathroom has access from pool area, Free Wifi and local and national calls to the USA and Canada . The Laundry Room has a large top loading washing and separate drying machine, Iron board and Iron, and this leads onto the Game Room. Game room has a pool table, air hockey & basketball game just to keep all entertained. At the back is a full length covered lanai, large pool, spa, a private screened paver deck, and no back neighbors. This home is ready for you! Security code entry door. No key drop off and pick up. High Grove is a gated community & also has an awesome clubhouse with arcade games, gym, billiard, pool and midget golf. Ideally located just a few miles from Disney World, restaurants & shops on US27 at the western end of US 192. Come and make magical memories in our villa! From Orlando International Airport: (approx 45 minutes) Take the South Exit from the airport and follow towards the 417 South. Take the 417 South (signed I-4 and Tampa) â€“ please note that the 417 is a toll road. About 3 miles down the 417 South you will encounter your first Toll Plaza. Keep to the right hand lanes at all Toll booths. Continue on the 417 until its end, where it merges with the I-4. Join the I-4 West (signed Tampa) and follow it to Exit 55. Leave the I-4 at Exit 55 and take Highway 27 North (to the left signed Clermont). You are going to proceed along US-27 for about 8 miles. As you approach the US-27 keep to the right and merge onto the US-27 North heading for Clermont. As you merge onto the US-27,you have actually just passed Highgrove on your left, so move immediately into the left lane and, at the first gap in the central median (McDonalds), do a Uturn, proceed a little way along and turn right into Highgrove Blvd. If you miss this gap in the median, proceed to the traffic lights and do a U-turn there. Proceed up to the gate. OPTION 2 (trickier, but usually slightly quicker) (approx 40 minutes Take the North Exit from the airport and follow towards the 528 West. Take the 528 West (signed I-4 and Tampa) â€“ please note that the 528 is a Toll road. Keep to the right-hand lanes at all toll booths. Continue on the 528 West for about 11 miles until its end, where it merges with the I-4. Join the I-4 West (signed Tampa) and follow it to Exit 64. Leave the I-4 at Exit 64 and take US-192 West Irlo Bronson Memorial Highway towards Magic Kingdom. Continue to follow the US-192 for about 9 miles, where it ends and intersects with the US-27. As you approach the US-27 keep to the right and merge onto the US-27 North heading for Clermont. As you merge onto the US-27,you have actually just passed Highgrove on your left so move immediately into the left lane and, at the first gap in the central median (McDonalds), do a Uturn, proceed a little way along and turn right into Highgrove Blvd. If you miss this gap in the median, proceed to the traffic lights and do a U-turn there. Proceed up to the gate. Beautiful Mediterranean style 4 bed/3 bath villa!